After practicing law for over twenty years, I retired to devote full time to writing novels. The Ballet is my fifth novel and the second in a series of romantic suspense novels set in the world of dance. My second book, Shadow of Doubt, a stand-alone, was a finalist for the RPLA 2016 Romance Novel of the Year. It was natural for me to choose the performing art as a setting for The Shadow of Dance Series because prior to law school, I was a freelance dance writer and critic, a board member for several ballet companies, and a member of the Dance Panel for the State of Florida Grant Awards. Although I was born and spent my early years in Atlanta, I have lived in Florida the majority of my life. I am currently at work on the third book in the Shadow of Dance Series, The Studio, as well as a political murder mystery. Gabi is a very talented ballerina. She could have a lead role in any big dance company in the world, but she’s chosen a small ballet company in Florida to follow her dream. Seems rather unusual and mysterious, but then just about everything about the woman is unusual and mysterious. She has her cozy life of dance and time spent with her cat, and she’s quite comfortable with the way things are. That is, until she meets the good looking doctor who happens to be the son of the ballet company’s benefactor. Then things start to unravel as the relationship gets serious and Gabi can’t tell anyone, not even the doctor she’s starting to love, her true story. Judith Erwin’s novel, The Ballet: Shadow of Dance Series Book 2, grabbed my attention from the first page. Combining mystery, intrigue and the beauty of classical dance and music makes this story a powerful expression of passion on so many different levels. The characters are both likeable and believable, as is the awkward position in which Gabi must lead her life of mystery. The plot progresses steadily with lots of interesting character interactions and moving dialogue that further defines each character. The author has a flair for building tension and moving the story along with ease, allowing the reader to believe that they are watching a performance unfold before their eyes. The author also obviously knows dance and music well enough to weave it effectively into the story. A compelling read full of unexpected twists and turns. The Ballet: Shadow of Dance Book 2 by Judith Erwin is a beautiful and heartbreaking novel that had me on the verge of tears at times. This is the story of love between a ballerina and a doctor, an odd pairing, but when love strikes, nothing is odd between them. Gabrielle Valera is a ballerina; she has the grace and beauty that awe people and make them gasp out loud. On stage, she is charismatic and simply stunning, off stage she is a scared woman who wants her safety and for that she is ready to defend herself. Derek Connor is a physician. He is wealthy, successful and content. He believes that love is not something that he wants in his life. However, when Derek meets Gabrielle, there is a spark that neither of them can deny. They have a desire to be with each other and love each other. Although Derek is ready to take a chance on them, Gabrielle is hesitant. What is holding her back? Can Derek break down the walls around her heart and get her to accept their love? This is a beautiful novel that gripped me from the very beginning. I loved the complex relationship between these two main characters. The development of their relationship was intense and very well-rounded. Nothing was rushed and the characters were given time to grow and blossom right in front of the reader. The narrative was good; it brought something new to the table and gave a new insight into the story and the lives of the main characters. I thoroughly enjoyed how they were together, how they brought life to the story and made me enjoy the story even more. I loved it all! The Ballet by Judith Erwin is the second book in the Shadow of Dance series, a sensual narrative with great appeal to fans of contemporary romance and performing arts. Gabrielle Valera is a distinguished ballerina who is loved for her grace and beauty, but she has a past that she may not want just anyone to uncover. And this could explain why she carries a semi-automatic gun with her. When she meets the rich ER physician, Derek Conner, the attraction between the two is strong, and while neither saw it coming, they find themselves falling deeper for each other. Gabrielle knows she can't give any assurances to Derek and she can’t let him know why. Can Derek penetrate the heart of this mysterious girl who awakens feelings he’s never known before? This is a very interesting read, sensually and emotionally rich, and fast-paced. The Ballet is a well-written story and I enjoyed the way the author explores the art of the dance. Right from the start of the narrative, readers know they will love the protagonist, thanks to the way the author captures her soul in the story. It won’t be surprising to learn that the author has been a dancer. The language is beautiful and the story develops around a powerful conflict. There is a dichotomy between the grace that Gabi exhibits in her performance on stage and the internal conflict she has. I enjoyed the vivid descriptions and the author’s rare gift with images. Judith Erwin allows the reader to penetrate the hearts of her characters, enabling readers to connect emotionally with them and be transported into their world and reality. This is one of those books you’ll read in one sitting. A beautiful blend of romance spiced with the allure of dance, The Ballet by Judith Erwin is book two in the Shadow of Dance series, a suspenseful and gripping story that follows two memorable characters in a love story with a surprising twist. Gabrielle Valera is an icon of the dance world — a woman whose beauty and musical performance translates the finesse of the art of dance. But why is it that she carries a gun with her? Why does her inner life not sync with the beauty she exudes as a ballerina? A rich ER physician, Derek Conner, doesn’t think that his attraction to the young ballerina will last long. She is a complex character who seems to hide a lot and, no matter how hard he tries, he can’t put a finger on why she can’t be completely open with him and why she can’t commit to him. How far can he go to win this mesmerizing beauty? The Ballet is tantalizing, engrossing, delightful, a novel that has what it takes to stir the emotions of the most indifferent reader, thanks to the author’s exploration of the psychological depth of the characters. The characters are awesome, fleshed out, and exciting. Gabrielle is complex, and there is something mysterious about her, something that draws the reader to her, making the reader want to learn more about her, and the author plays with this development so well to keep the reader’s interest. While Gabrielle is a professional, very confident dancer, there is a fear that inhibits her and it begins to be noticeable as she collides with the physician. Judith Erwin is a master in crafting gripping plots, creating a story that is fast paced and emotionally engaging. It didn’t take me long to like her characters. One feels that she writes about characters in a field she knows so well and she does so in an irresistible style. The Ballet by Judith Erwin is book two in the author's Shadow of Dance series, preceded by The Ballroom. Both books read as stand-alones, and The Ballet follows Gabrielle (Gabi) Valera as she prepares for her first showing as principal dancer in her company's premiere of Swan Lake. Struck down by pneumonia, Gabi is soon introduced to Dr. Derek Conner, who makes a generous contribution to the company. His gestures continue, but Gabi is reluctant toward his advances, resulting in a cat and mouse game, with Gabi - who has concealed more than anyone but a handful of protectors know - running out of places to hide. 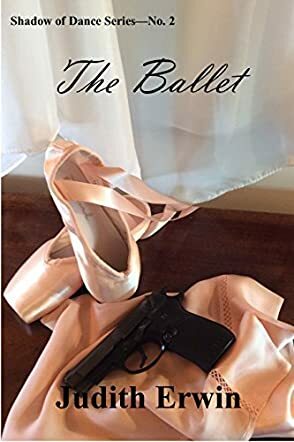 The Ballet by Judith Erwin is a wonderful thriller that weaves itself in and out of the world of performing arts, which is no small feat when we come to understand what it is being woven. Gabi's dark family history and the skeletons in her own closet are the only things that mar the beauty of what Erwin presents in alluring detail about ballet...but my goodness, it sure makes for a heck of a plot driver. The characters are well fleshed out and there is tension on every page, with revelations spoon fed by Erwin in bits and pieces at just the right pace. I love a good story of intrigue and suspense, but when the precision and gracefulness of the writing are ably matched by that of its titular art form, it more than warrants a comfortable five stars.